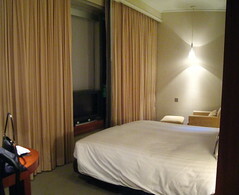 At right, our room at Novotel CityGate Hotel near Hong Kong Airport (HKG). En route from JFK we had a 14 hour overnight layover here before transferring to a separately booked flight on Philippine Airlines to Manila. Last time I had such a layover I got a sleeping cubicle at the Plaza Premium Lounge in the airport, but having a wife on this trip called for a hotel room so we could relax and freshen up en route. Main thing about HKG is that it’s actually quite far from Hong Kong, 30 minutes from the city by high-speed train. Until recently, if you wanted to stay in an airpot hotel your only real choice was the Regal, right outside the terminal, but rooms there run you over $300 for one night. Otherwise you have to go into the city — not something I wanted to do with our giant bags. Novotel Citygate opened in 2006 in Tung Chung, a town on Lantau Island near HKG, initially developed to support airport personnel, now home to its own thriving commercial scene. The hotel has a free shuttle which leaves twice an hour on the :15s and the :45s, but is not very prominently advertised. After coming out of Arrivals, hotel transport desk B16 will have a little Novotel Citygate sign on it, where you can tell the guy how many people and how many bags are with you, then sit around before joining the shuttle group on a trek through a maze of twisty passages, all alike, ending at the bus, parked at a crew entrance under the new HKG Terminal 2. They load your bags for you, and then it’s a quick five to ten minute trip out of the airport complex, over a bridge, and into Tung Chung. As with most modern hotels, guest rooms use key cards dipped into door slots, and left in a power slot to turn on the lights and air. Lights are a bit confusing, controlled from a large main switch which, when held down, cycles through various on/off and brightness schemes for all light fixtures in all parts of the suite. The space is divided into bath and living areas by a large partition, a sliding door closing the entry side of the bath area. (Most guest rooms, however, do not have this partition, but have the bath area open to the living area, divided only by an artsy central glass column.) There are two sinks (probably just one in the standard guest room), separate glass cubicles for toilet and shower, and a wonderful “rainstorm” shower head. Complimentary soap, shampoo, mouthwash, and lotion come in plastic tubes with caps that are quite difficult to twist on and off — possibly a brilliant theft deterrent. The standard furnishings are available in the living area — bed, desk, easy chair with ottoman, TV with fun Chinese and English shows; but there is no free hotel internet. Apparently you have to purchase a 3-hour prepaid internet card from the concierge to use wifi — we did without. The window provides a lovely sweeping view of Tung Chung, Lantau Island, and the Ngong Ping Skyrail from higher floors — we didn’t see it much, though, as we slept quite soundly in the rather firm bed. The shuttle back to the airport the next day dropped us right off at Philippine Airlines in Terminal 2 for check-in. Total cost for a one night layover, with light sports bar dinner and breakfast buffet: ~US$260. That’s actually a bit stiff, but still more than US$100 lower than an equivalent reservation at Regal. For more info: Official hotel page here, and TripAdvisor reviews here.